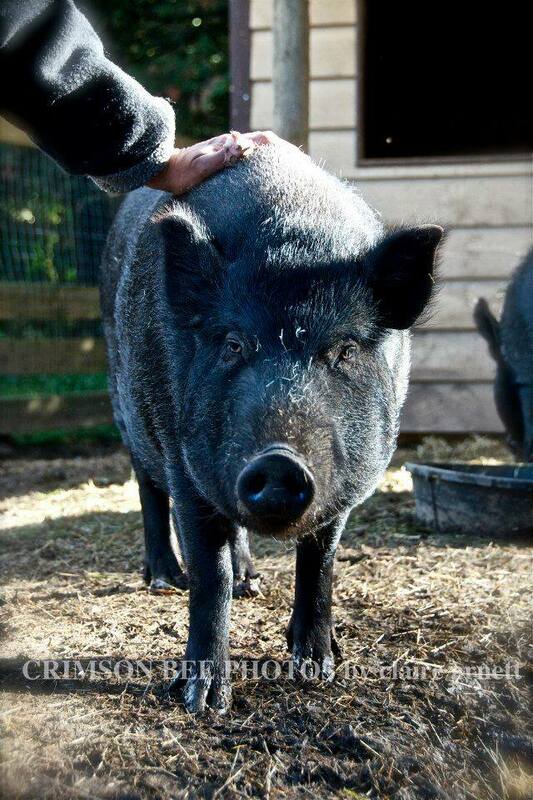 Poppy and her two brothers were being sold on Craigslist as pot bellied pigs. A wonderful dog rescuer contacted us and offered to pay all expenses if we could make room for these big kids. Poppy is a Guinea Hog, not a pot bellied pig, unfortunately we have been told that her breed are the new favoured "meat pigs" as they are gentle and do not get as large as Farm Pigs, to think these beautiful, intelligent and sentient beings would be someone's dinner is heartbreaking to us. She has amazing wild-like eyes and lovely copper tipped bristles running down her back. Like a cat she will come to you and lean into your leg while open mouth chatting her ah ah ah's..